Who is he? 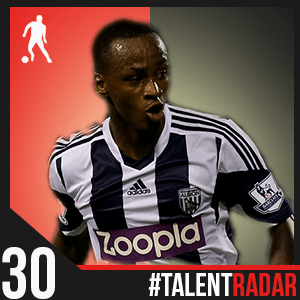 : Berahino is a 20 year old striker who plays for West Bromwich Albion. He has also represented England in all age groups up to the U-21s. Back in 2013: Berahino failed to make the squad in any of the league games in the 2012-13 season instead going out on a short loan to Peterborough in the Championship and featuring for the West Brom U-21 team. He was an unused sub for the first 2 league games of the season before coming off the bench against Swansea. This was followed by 3 more substitute appearances including one at Old Trafford where he scored in West Brom’s 2-1 win over Manchester United. He’s added 3 more goals to his tally in the 4 starts and 11 substitute appearances he’s made in the league. He also scored 4 goals in 2 League Cup games against Newport (hat-trick) and Arsenal. Berahino has started in 4 of the England U-21’s 5 qualifying games thus far and has scored in every appearance including braces in his last 2. Looking to 2014: Berahino has already started 2014 with a bang scoring the only goal of the game against Newcastle. With West Brom announcing Pepe Mel as their new boss, Berahino will be looking to impress and continue being involved with the first team. Who is he? 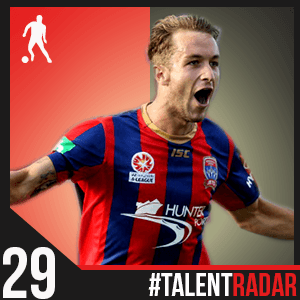 : Adam Taggart is a 20 year old Newcastle Jets player. The striker has already made 4 appearances for Australia. Back in 2013: After making most of his appearances off the bench in the first half of the 2012-13 season, it was in 2013 that Taggart saw a rise in his game time. He started all of the last 7 games of the season. Taggart scored 2 goals and an assist in this run of games. He started in all of Newcastle’s first 13 games. He’s scored 6 times in the league thus far including a hat-trick against Melbourne Heart. He started all 3 games for Australian U-20 team in the World Cup but failed to find the back of the net in the tournament. Looking to 2014: One of the brightest young talents in Australian football, Taggart is one whose progress will be keenly followed by clubs in Europe (and us obviously). Having already appeared for Australia, Taggart will hope to improve his goal-scoring ratio in the league. Who is he? 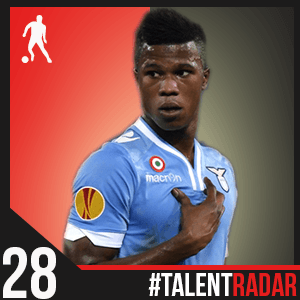 : Keita is a 18 year old who plays for Lazio. He is yet another product of Barcelona’s famed youth academy and is eligible for both Senegal and Spain. Back in 2013: After becoming eligible to play for Lazio, Keita spent the first half of the year playing in the Primavera. An impressive haul of 7 goals in 12 games was enough to warrant a place in the first team this season. He’s been eased into the first team this season. After 3 appearances off the bench, Keita was handed his first start against Parma and scored a goal to mark the occasion. He also scored in the 4-2 loss against Napoli. In total, Keita made 2 starts and 6 substitute appearances. He’s seen a lot more action in the Europa League starting 5 of the group stage games and coming off the bench in the other and has registered 4 assists in the competition. Looking to 2014: Big things are expected from the Spanish born player and we’ve seen glimpses of why. At 18, he’s one of the younger players on our list and 2014 should be another good year for him. Who is he? 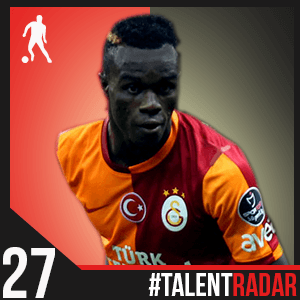 : Bruma is a 19 year old winger who plays for Galatasaray. He’s represented Portugal in various age groups and currently plays for the U-21 team and is on the fringe of the senior team. Back in 2013: 2013 has been an eventful year for Bruma. He spent the first half of the year at Sporting Lisbon and made the step up from the B team in February. Bruma wasted little time and scored in his 2nd start against Gil Vicente. He registered an assist in the very next game against Estoril. He made a total of 11 starts and made a further 2 appearances off the bench. He then joined Galatasaray in the transfer window. He has featured in 7 league games for Galatasaray started on 4 occasions and coming off the bench on 3 more occasions chalking up 3 assists in the process. He also started 4 games in the Champions League group stage as Galatasaray progressed to the round of 16. Bruma had an exceptional U-20 World Cup where he scored 5 goals and assisted 2 more in 4 appearances. He scored in his only appearance of the year for the U-21 team against Israel. He was also an unused sub for the senior side against Luxembourg and Sweden. Looking to 2014: 2013 was an outstanding year for the youngster and he’ll be hoping that 2014 will be similar. He’ll be hoping for a few more starts in the league and of course the 2 legs against Chelsea in the Champions League. After 2 games in which he was an unused substitute for his country, his first senior appearance shouldn’t be far away. Who is he? 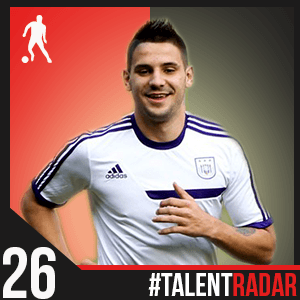 : Mitrovic is a 19 year old striker who plays for Anderlecht. The young Serbian has already been capped at senior level. Back in 2013: Mitrovic started the year a Partizan player and continued his good form from last year. He started regularly for the side and scored goals at a decent rate. The only games he missed in the first half of the year was due to suspension. He started the season at Partizan scoring a brace on the first day of the season. He subsequently moved to Anderlecht and came off the bench at half time to record 2 assists against Zulte-Waregem. He started the next game and duly scored 2 goals. His eventful start to Anderlecht continued with a red card in the very next game. His career in Belgium has started impressively with 9 goals and 4 assists in 14 games thus far. Serbia won the U-19 European Championship and Mitrovic was an integral part of the team as he was adjudged to be the best player of the tournament. Mitrovic has already made 3 caps for the senior team even scoring against Croatia in a World Cup qualifier. He’s also a regular starter for the U-21 team. Looking to 2014: Mitrovic has already come under the scanner of bigger teams given his blistering start in the Jupiler Pro League. He’ll be hoping to keep banging in the goals for Anderlecht and Serbia come the new year. Who is he? 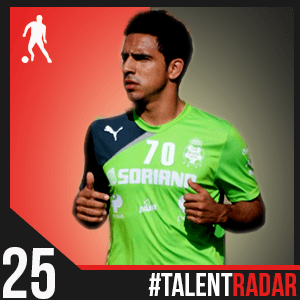 : Escoboza is a 20 year old who plays for Santos Laguna in the Liga MX. The winger is part of the senior Mexican team already. Back in 2013: Escoboza spent the first half of the year on loan at Nexaca appearing 7 times in the first half of the year. He’s played a much bigger role at Santos since his return. He’s made 9 starts with a further 3 appearances off the bench in the league and scoring 2 goals and registering 3 assists in the process. He’s also scored in the Copa MX. He came off the bench for Mexico against Finland scoring in the 4-2 win and also made substitute appearances in both legs of Mexico’s 2 leg wins over New Zealand in the World Cup qualifiers assisting 2 goals. Escoboza was also part of the the Mexican U-20 team scoring against Mali in a 4-1 win starting 2 games in the tournament. Looking at 2014: One of the brightest young talents in the Liga MX, Escoboza will be looking to move to Europe much like a few of his national teammates. With the World Cup nearing, he’ll also be hoping to nail down a spot in the national side. Who is he? Boakye is 20 year old who plays for Juventus. The young striker is on loan to Elche in Spain and plays for Ghana. Back in 2013: The striker spent the first half of the year on loan to Sassuolo in Serie B and played an important part in their promotion to the Serie A. He scored 11 goals and 7 assists in the season long loan as Sassuolo finished champions in the Serie B. He joined Elche on a season long loan deal from Juve and scored on his debut against Almeria. He’s made 8 starts and 7 substitute appearances adding 2 goals to the one against Almeria. Boakye was part of the U-20 Ghana side who finished third in the tournament. He scored 2 goals and an assist in the tournament. He was also part of the Ghana squad for the African Cup of Nations although he failed to make a single appearance. He did score against Egypt in a friendly after coming on at half time. Looking at 2014: After 3 consecutive loans (first was from Genoa to Sassuolo), Boakye will be looking to impress in the second half of the season in Elche and then play a role at Juventus. Time is obviously on the side of the young striker and he’s definitely one to watch out for. Who is he? Berardi is a 19 year old who plays for Juventus (co-owned at least). He is on loan to former club Sassuolo for this season and plays for Italy in the junior levels. 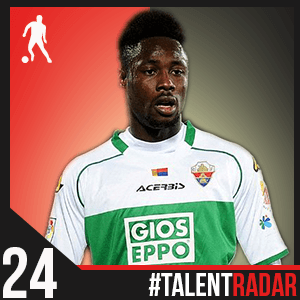 Back in 2013: Like Boakye, Berardi played an important role in Sassuolo’s promotion campaign. He started 26 times and made 11 appearances off the bench in the 2012-13 season. He scored 11 goals and 6 assists in the season. This season has been even better for the youngster as he’s played most of his games on the right wing but is also capable of playing on the other wing or in a more central role. After being suspended for the opening 4 games, Berardi returned and wasted no time in showing that he is indeed the real deal. He’s scored 7 goals and 5 assists in 12 starts and 1 substitute appearances with the highlight being a hat-trick against Sampdoria in a 4-3 win. Berardi is a part of the Italy U-19 team and started in friendlies against Slovakia and Germany providing an assist in the latter game. Looking at 2014: Berardi has made the step up to Serie A admirably and will be looking to continue his good form in the 2nd half of the season. Like Boakye, first team football at Juventus is going to be tough and it remains to be seen what plans the Italian giants have for him. Who is he? 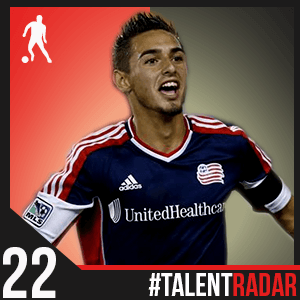 Diego Fagundez is an 18-year-old, considered to be the brightest prospect in the MLS. He’s currently at New England Revolution and is eligible for both Uruguay and the United States. Back in 2013: The past calendar year is when Diego Fagundez established himself and realised his potential. A lot of big things were expected of the youngster and he didn’t disappoint. After failing to make the grade for the initial games of the season, Fagundez got his first start against Philadelphia Union, scoring in that game and he has never looked back for the remainder of the season. He only failed to start 2 games since then until the end of the season, making a total of 28 starts in all (31 appearances in total) scoring an impressive 13 goals. His best performance came in the 5-0 victory over La Galaxy where he set-up two and scored one himself. The Revs finished 3rd in the Eastern Conference, but lost out against Sporting Kansas in the play-offs as Fagundez played the entire 210 minutes of the tie. He finished the season as the clubs’ top scorer, 5th overall in the MLS behind the likes of Keane and Di Vaio. Fagundez didn’t have the most fruitful 2013 in terms of International football. He failed to receive a call-up from Uruguay for the U-20 World Cup while he was deemed ineligible for the US as he didn’t possess citizenship at the time (both nations had qualified for the tournament). Thus Fagundez didn’t make a single International appearance in 2013. Looking at 2014: With the 2014 MLS seasons due to kick off in a month or two, Fagundez will be hoping to continue from where he left off. He is arguably New England’s most important player, still only 18 mind you. Internationally, Fagundez will again me done over due to a technicality. A call-up to Uruguay for the World Cup is unlikely, and despite a green card, he has to wait a few years before being eligible for the US. A move to European football could also be on the cards for the talented youngster. Who is he? 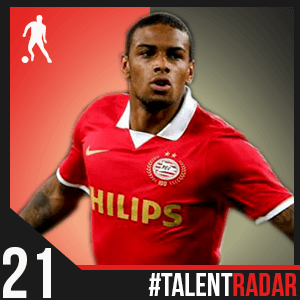 Jurgen Locadia is a 20-year-old striker who plays for Eredivise club, PSV Eindhoven. He has played for the Dutch youth sides and is yet to earn a senior cap. Back in 2013: Locadia had a slow start to 2013, largely restricted to substitute appearances and getting just 2 goals in the second half of the 2012/13 season. The 13/14 season proved to be his breakthrough campaign. Though PSV have struggled, relying on a youthful core, Locadia has been one of the positives of the season leading the line upfront. He made 15 appearances in total, starting 10 of those and a decent return of 5 goals. He scored a brace against ADO Den Haag in the last Eredivise game of the year. He even made his Champions League debut in 2013, against Zulte-Waregem in the qualifying round, scoring within 3 minutes of coming on in his debut. PSV failed to make it into the group stage and have failed to make it past the group stage in the Europa League but Locadia remains an impressive performer. Locadia has made a couple of appearances for the U-21 Dutch side, scoring once against Croatia. Internationally he has found it difficult with the impressive options the Dutch have in attack. Looking at 2014: One of Locadia’s main goals would be to help PSV to rise in the Eredivisie as right now, they are a shadow of their former selfs. But individually, Locadia will be hoping for a surprise call-up to the World Cup in Brazil. He’s going to get regular starts, it’s up to him to impress with performances.